Pasta and red meat for dinner. Lentils / rice / quinoa e.t.c. No added sugar muesli (with soya milk and maybe blueberries / raspberries). 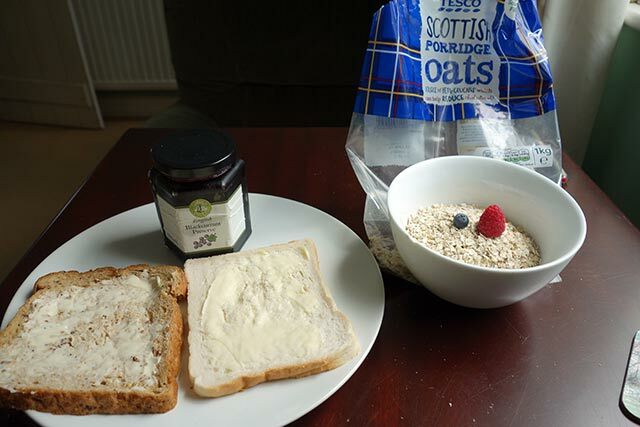 See also: Cycling Breakfast – or French breakfasts are rubbish. Lentils or rice, vegetarian sausages, fake meat, lightly fried vegetables, quorn and vegetarian gravy. If I’m in Yorkshire, my mother may make Yorkshire pudding and stuffing which is a real bonus. Pudding: Carrot cake / dark chocolate kit kats. Pudding – is it allowed? To serious procyclists, pudding or any sweet foods may be completely off the menu. I’m lucky in that my metabolism can burn away just about any quantity of sugar. So, even if I eat carrot cake, I don’t put on weight. Use your common sense. Eat a good balance of healthy foods is the best way to get all the minerals and vitamins needed. Glycaemic Index – Foods with a high glycaemic index increase the blood sugars rapidly. Foods with a low glycaemic index raise blood sugar levels gradually over a period of time. Therefore, before the start of a ride and at the beginning of a ride it is good to eat foods with relatively low glycaemic index. These foods include: apples, bran, spaghetti, baked beans. For example, brown bread is a lower GI index than white bread. Therefore, it is better to switch to brown bread before a ride. Foods with a high glycaemic index are better eaten at the end of a ride. High GI foods include: bananas, potatoes, jelly beans. Getting constant energy levels and avoiding blood sugar spikes is helpful for cycling. Right balance protein / carbohydrates. One mistake cyclists can make is to just eat carbohydrates; but for recovery and long term good health, you will need a mix of carbohydrates and protein. The diet of some procyclists, e.g. Team Sky is relatively low in carbohydrates, especially on days when they are not riding too much. Keeping carbohydrates low is the most effective way to avoid weight gain. Good balance – When doing long rides, it is good to take a balance of foods. For example, I like the ‘natural raw food bars’ pictured left. It makes a good change to the maltodextrin based energy bars and drinks usually found in cycling. A good balance of food is important both physically and psychologically. Little and often – It is often stated that the body can absorb 60-80 grams of carbohydrate an hour. For training rides of two hours or less, it is not needed to eat. In fact riding without taking on sugar will help improve your fat burning capacity – which is a good part of training. However, for long rides of 3 hours plus, you shouldn’t wait until you feel hungry because then it will be too late. The body can only process a limited amount of cars an hour, so for hard rides, you should try to achieve this every hour. If you eat 200 grams all at once, the body won’t be able to process it, and it will be counter-productive. This is important for races lasting over 2 hours such as a 100 mile time trial. There is only so much food the body can take per hour, therefore, there should be a constant supply of food. What are good foods to eat when cycling? Custom energy bars. Tend to be expensive, but can choose bars which have mixture of carbs and protein. I often buy similar bars, which are not specifically manufactured for athletes. These tend to be cheaper. For example, Fruesli bars, Nutri Grain bars e.t.c. Liquid energy / maltodextrin.. – The simplest way to take on board energy. Good for short races where digestion is difficult. Recovery bars / recovery drinks. 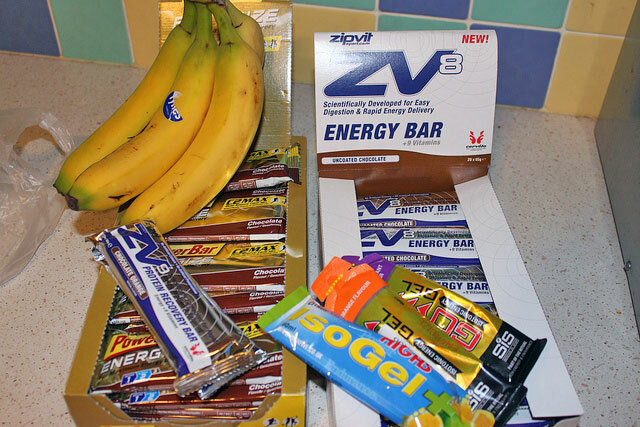 For a 2-3 hour ride, I often take recovery bars to eat towards the end of the ride. It is good to start taking on protein to aid recovery. When I started cycling in the 1990s, I thought pasta was the ‘superfood’ of cycling. It is a complex carbohydrate which enables long-lasting energy sources. However, in recent years, it has fallen out of favour amongst some cycling teams. The logic is that pasta is quite a ‘heavy’ starch / gluten, which is more difficult for the gut to digest. Therefore, gluten free carbs have been preferred, hence the growth in rice / lentils, quinoa, buckwheat e.t.c. Italian teams still stick to pasta by all accounts. It may also depend on how tolerant you are of digesting gluten. The pasta scare may be slightly over-done. I sometimes have pasta, though have got into a habit of red lentils and pasta. In the past few decades, supermarkets have become very successful in marketing certain types of foodsas ‘super-foods’. It appeals to that part of us, which thinks we can make ourself wonderfully healthy and faster cyclists, simply by eating some Peruvian waterbeans grown in moss-covered peat. Of course, it’s not as simply as that, but a good diet can definitely help. A plate of superfoods for lunch. A cynic might suggest to be a super food requires some or all of the following characteristics. Primarily bought from health food stops. To be twice as expensive as normal foods. To have an exotic name and label, preferably grown in a suitably exotic location of the world. To be endorsed by some celebrity chef or nutritional expert. To taste ‘healthy’ i.e. not particularly great, so the best way to get people to eat it is to call it a super food. Despite a healthy ‘scepticism’ about superfoods, I’m still intrigued by the idea, and am an enthusiast (or mug) for buying expensive super-foods. If nothing else it is food for the mind. You get a certain mental satisfaction out of chewing your way through some raw wheat grass. I mean if it tastes of grass, it must be good for you right? In this regard, Marks & Spencers has created a niche as being the leading purveyor of expensively packaged cous-cous and raw carrot super-food mixtures in the world. BTW: Who would have thought it that at Britain’s motorway service stations, you can now buy a meal of wild blue green algae with Spirulina? Whatever happened to that ritual of clot-inducing fry ups and a mug of warm tea? Marks & Spencers on the motorway service station is the silent revolution of British cuisine. It’s easy to mock, but when I go to the US, I miss this assortment of easy to buy healthy foods. Honey – moderate GI index. A natural source of sugar. Apparantely, native Russian beekeepers who aet a diet of honey regularly live past 100! Apples – An apple a day keeps the doctor a way. Great low GI energy source, and packed with naturally occurring Vitamin C and other antioxidants. Cheaper than more exotic fruits often labelled ‘superfoods’ but just as effective. Bananas. Where would cyclists be without bananas? Not just great for nutrition, but also good for sticking down your back jersey pocket, and then seeing how far you can throw the banana skin into nearby field. Yogurt. Good for the gut. Green vegetables – broccoli, cabbage, cauliflower, rocket, lettuce, Swiss Chard. Wholegrain seeded bread. 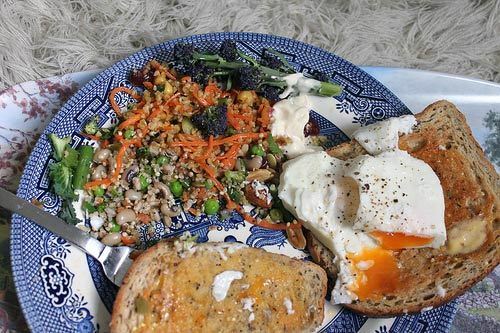 Switching from a processed white loaf (high GI) to wholegrain seeded bread, is easiest ways to improve diet. Seaweed – high in calcium. The chemical composition of seaweed is very close to human blood plasma and helps regulate blood. Blueberries – high in antioxidants. Marmalade sandwiches – the pre-race snack of Graeme Obree before his world hour record. Dark chocolate with over 70% cocoa content. Not all super-foods have to be boring. Super foods are often over-exaggerated. You don’t become an amazing cyclist by eating some secret combination of ‘super-foods’ However, it is good to eat a variety of fruits and pulses with high-anti-oxidants and good mineral source. These are the main snacks I take on a ride. Power bars, protein bars, bananas. I buy them in boxes of 24. I also take some of the (non-cycling specific) nutri-grains or Fruesli bars because they are cheaper. I take liquid energy snacks when I’m doing intervals or really hard rides when the stomach is under greater stress. Before a long ride, I will have a good source of complex carbohydrates (e.g. lentil / rice mix) or some pasta. Avoid temptation to eat much more than usual. You will just give yourself stomach problems, which won’t help. Sometimes for early morning race, I have a small bowl of oats for supper. Rather than have super big meal. Don’t just think about the present day; think about how your food will affect your ride on the next day. If you have a long ride for tomorrow, eat good quantities of complex carbohydrates the day or two preceding. You can consume double the amount of usual calories during a 100 mile ride. During the Tour de France, riders can consume up to 7,000 calories a day. At this kind of intensity it can become difficult to replace as many calories as burnt. When it comes to supplements, I don’t really take anything. My mother buys me multivitamins and about once a month I take one. I’ve experimented with Beta-Alanine and Beetroot juice, but gave up after a couple of months. I like the idea of not taking any supplements. If I had poor health, I would listen to suggestions about missing food groups / vitamins. But, I don’t want to start taking anything like creatine or the like.